Trailersteading on sale for 99 cents! 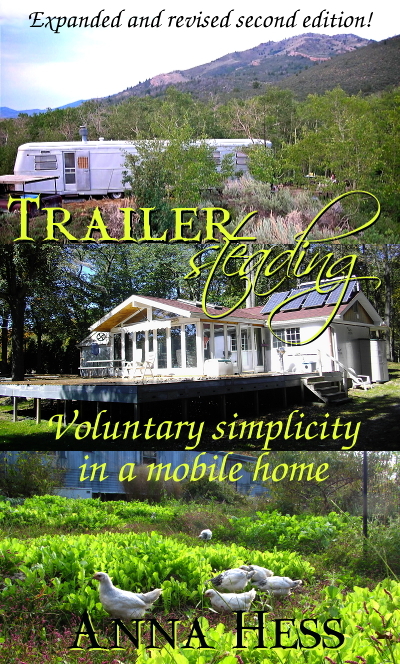 Trailersteading began as a joke, turned into an inspiration for aspiring homesteaders, and now --- in its expanded second edition --- the ebook contains dozens of pages of additional hands-on information to help turn that inspiration into a reality. Even if you don't want to live in a mobile home, this book contains step-by-step instructions for replicating some of our permaculture systems, like treating greywater in a wetland that provides beautiful wildlife habitat and also grow cattails for the table. There are sections on rain barrels and humanure, along with thirteen case studies of homesteaders who have embraced voluntary simplicity in a mobile home. And, of course, if you think a trailer might be in your future, the book will be even more helpful with tips on insulating, fire-proofing, and much more. Trailersteading usually goes for $5.99, but it's on sale right now for 99 cents. So snag your copy and enjoy! On a related note, I want to thank Buck Books for featuring Trailersteading (a link to which will go out in their daily deals email tomorrow). If you're like me and read voraciously (and especially if your library is very small), it can be a struggle to feed your literary appetite. Since authors often run free or very cheap price promotions as a way of getting our books in front of new eyes, it's possible to stock up on books for no or very little cash. Buck Books is one of the services that helps hook up authors with readers, and if you're in either camp, then I recommend you check them out!